The Segment tool is used to speed up the flattening of "hard" surface geometry, that is, non-organic shapes like buildings, furniture and other props. Click this to detach and drop all marked polys. Each separate object is segmented into a number of shells depending on each poly's surface normal. Polys that are facing in a similar direction are kept together, but when the angle between them is too sharp, they're split apart. Dropped shells are boxed. This makes it easier to move them around as a group. When set to Off, no re-welding of shells is performed. When set to R, shells that form parts of revolved shapes (e.g. pipes, wheels, bolts, balls) are welded back together. When set to All, all remaining shells are welded so long as no overlaps are created. This angle determines at which point adjoining polys are split apart. Increasing this angle will result in less fragmentation (i.e. fewer shells), but there will be more distortion in the resulting UVs and extra cuts or darts may need to be added. Reducing this angle will increase the fragmentation, and so more time will need to be spent welding shells back together. The grey Threshold button gives you the option to manually segment some or all of your model. Mark one or more faces with the G hotkey, then click the button and adjacent polys facing the same way, within the threshold, will be filled in. During the final welding phase, UVLayout checks for any narrow V shaped seams in the UVs, and these are also stitched up. Normally "narrow" means than the gap between the end points is less than 1% of the length of that edge, but you can increase that with this setting. A larger percentage will mean that wider gaps will also be stitched up. If you are unsure, leave it on 1% for the normal segment processing, then check the final results for any V shaped gaps. If you find some, LMB select those shells, increase the percentage, then click the gray Weld Gaps button to stitch them up. Normally to weld shells you first tag edges with the W hotkey, then use M to bring the shells together, then tap Enter. When Fast Weld is turned on, you simply LMB click an edge then tap Enter to weld the two shells. To help you determine if the selected edge is one you really want to weld, a curve is drawn to the matching edge, and a wire-frame preview of the matching shell is drawn in where it'll be welded. If you want to swap which shell gets moved, use the S hotkey. Red curves indicate that the edges can be welded, a blue curve means you can't weld them (i.e. you can't weld a shell to itself), and no curve means no matching shell can be found (i.e. the adjacent poly hasn't been flattened yet). After the selected edge has been welded, you can use the W hotkey to automatically weld any narrow V shaped gaps that remain. The Weld Gaps percentage applies here too, so if you make that larger, wider gaps will be welded. Another effect of Fast Weld mode is that cut edges aren't opened up when you use the C hotkey. 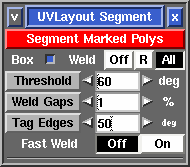 This is the same as having the Open Cuts in UV View preference temporarily turned off, and it allows you to cut and weld pieces together without needing to re-optimize the flattening afterward. This page was last modified 24 March 2016.